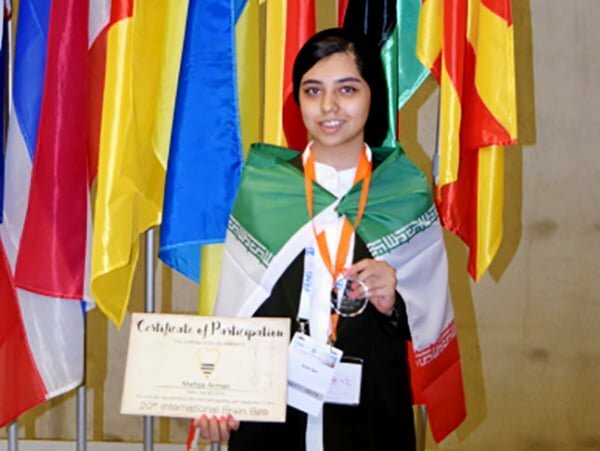 An ingenious Iranian girl has finished fourth at the 20th International Brain Bee (IBB) competitions held in the German capital, Berlin. Mahsa Arman managed to secure the fourth place at the event which brought together participants from 25 countries. The contest was held in parallel with a conference of the Federation of European Neuroscience Societies. The IBB contests are held every year in a different country in conjunction with a neuroscience conference, ISNA said in a Saturday report. It brings together ingenious school students from around the world and prepares the ground for the promotion and development of disciplines associated with cognitive sciences. National Brain Bee competitions are also held in Iran. The contests are organized by the Iranian Neuroscience Society in cooperation with the Education Ministry. The competitions are held every year in two phases in all provinces.